I don’t know about you, but I find that what controller you use has a massive impact on the satisfaction you get from a game. Sure, you can use keyboard commands, but a joystick built for the game is a tremendously cheering thing. And sure, you can use a modern USB joystick – but where’s the fun in that? Chris Swan thinks so too, and has hacked a lovely 1980s Competition Pro 5000 (hurrah for eBay) to work with the GPIO pins on his Raspberry Pi. 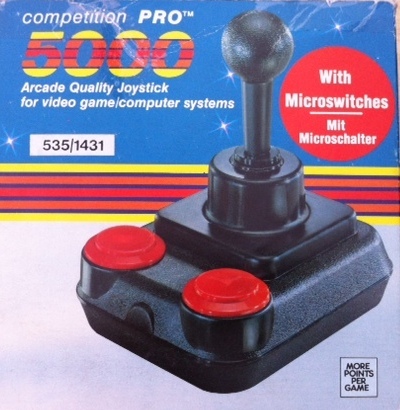 The Competition Pro 5000 - back in the day, the Amiga user's joystick of choice. I'm looking at my DualShock3 PS3 controller and experiencing feelings of vertigo. If you want to adapt your own retro joystick, there are hardware instructions and Python script to get everything working on his site. Frankly, the whole thing has me feeling like a 9-year-old with a bad haircut and twitchy thumbs again. Thanks Chris! Mame is so cool. Have to do this and hook my pi up to an lcd and get this running as a tabletop. Get some old school games going like pacman or donkey kong. That would be cool. That reminds me, I’ve a Competition Pro joystick in the cupboard somewhere. Almost exactly the same as the 5000 above but with an additional button + usb connection. No GPIO hack required! You think it will be possible to have 2 USB Joystick (like the one you mentioned above) connected to the RPI ? And with MAME, browse, select a game .. and play some 2 players game ? Where does he get the ROMs from? Downloading them from the Internet is illegal. They only legal way to get them (and that is only legal in some countries) would be to dump them from actual arcade machines as backups. Some ROMs are legal. Check the official MAME website for their list of ROMs that can be legally downloaded. Because you still have to wire the switches in the joystick into the Pi somehow. But yes, you could build the Pi into the base of a joystick and wire a stick and button(s) up this way. What it needs now is support for more buttons. Excellent, it’s exactly why i bought a Raspberry Pi! speaking of emulations i have been creating a launcher for the pi. The UI is being designed for snes input ports (gpio) my brother is working on and it also handles a usb gamepad or keyboard for navigating the UI. It can launch any rom as long as the emulator for the rom is installed. We are also making key combos to quit the running emulator to go back to the UI. We are trying to make a all in one system for a tv so when you launch the pi it takes you straight to this launcher. 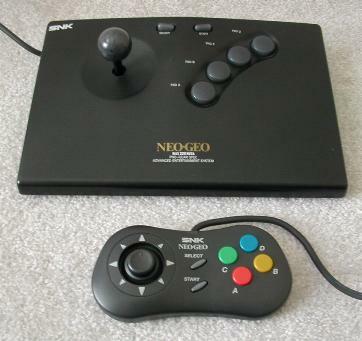 actually, if you are simply playing Neo geo games on your rapbian, you would actually want the authentic NeoGeo controllers, not some knock off with only 2 of the 4 buttons – for the original feel and capability of King of Fighters and other NeoGeo games that require the extra buttons. Can you wire that up to the GPIO next? Love MAME. Spent far too much time in my youth playing arcade games, used to be pretty good at Tempest. I am still surprised at how good some of those early arcade games still are, and also how bad some others are that I used to love. My kids love Pacman. I wonder if you could fit the pi into the joystick case. MAME is great, but I’d love to see some actual progress on FCEU and ZSNES or SNES9X. Performance of FCEU on the Pi is abysmal, even worse with sound enabled and there is not even a partially working SNES emulator in the repos. Too bad most emulators rely on OpenGL and hardware acceleration, and even worse most of them are i386 only. and no amount of sudo dpkg -i –force-architecture is going to fix that. I love these emulators! Until now, I have not tried anything else than the RetroArch emulator. If you want to give it a try with an auto-installer script, you can find everything at http://petrockblog.wordpress.com/2012/07/22/retropie-setup-an-initialization-script-for-retroarch-on-the-raspberry-pi/. Have fun! What a great project – thanks for the pointer. I’ve now adapted the Python to use internal pullups, so the DB9-GPIO connection is now nothing but wiring. I’m planning to make something to attach the joystick port(s) to GPIO, but that should be cheap, simple and robust. Great work! I’ve been trying to find a way of doing this myself, to avoid the need to occupy USB ports, or to have to buy a USB keyboard encoder for interfacing arcade quality joysticks & buttons (they generally cost more than a Pi!). I assumed it would require delving into drivers. This would allow you to build an emulation gaming rig into the base of a joystick, but still allow you to plug in a mouse/keyboard for config or extra USB gamepads for multiplayer. Plus they have extra spots to solder on more buttons, I think this joystick better than the other they have because it has a jumper on it that turns its controls in arrow keys and spacebar for use with flash webgames which is cool.